The LaRose site is the location of the main office of Agnico Eagle in Cobalt. This was the site of the original LaRose Mine, as well as the Silver Miller mine and mill, established in the 1950s. In the early 1990s, there were several buildings on the site, some dating from the original LaRose operations and some more modern. There was also waste rock on the site, several mine workings, and a small tailings deposit north of the site, adjacent to Mill Creek. 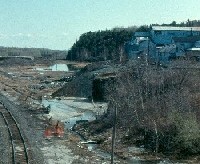 Reclamation efforts on this site have included the removal of many of the buildings and the hazardous wastes stored on site, and fencing of the mine hazards. 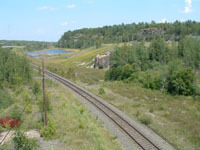 In addition, it appears that some of the waste rock piles, such as the pile on the northwest slope of the site, near the railway tracks, have been recontoured, covered, and revegetated. 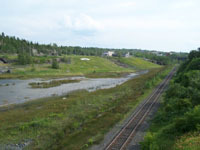 The course of Mill Creek near the LaRose site is also more vegetated than in the early 1990s, though it is not known if this is a result of natural revegetation or active efforts to revegetated the area. As they were in the early 1990s, the tailings at this site are largely under water, and there is wetland type vegetation growing along the edges of the tailings, in some shallow areas in the tailings. Overall, this site, one of the most visible in town because of its location along the railway tracks, and its visible from the highway leading into town from the north, looks considerably better than it did in the early 1990s. However, as also described for some other sites, improving the look of a site, while very important from an aesthetic point of view, does not always contribute to the reduction of releases of arsenic and other contaminants, particularly releases to surface water. Future monitoring efforts should include sampling to assess any releases of arsenic from the site to Mill Creek. In particular, samples should be collected from the creek draining the tailings deposit, to compare current arsenic concentrations with those reported in the early 1990s.